Brandon DeNoyer, one of the bright young minds in collegiate soccer joined the Mississippi State soccer program announced by head coach Tom Anagnost in August 2017. DeNoyer comes to MSU after a successful six-year stint at Siena College in Loudonville, N.Y., where he helped lead the Saints to the 2015 Metro-Atlantic Athletic Conference crown. At Siena, DeNoyer was the lead assistant coach and was over the day-to-day operations of the program. He was also responsible for the primary goalkeeper training for the Saints and trained the 2014 MAAC Goalkeeper of the Year. A native of Scotia, N.Y., DeNoyer joined Siena after three seasons as an assistant coach for his alma mater—State University of New York (SUNY)-Old Westbury, where he assisted with the men’s soccer program and was a volunteer goalkeeping coach for the women’s squad. 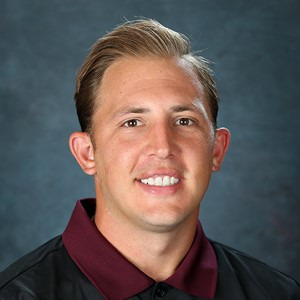 In addition to his collegiate coaching experiences, DeNoyer has a wealth of experience training goalkeepers and other positions through camps and extended club coaching experience. DeNoyer holds Regional, National, and Advanced National diplomas from NSCAA as well as a United States Soccer Federation “D” License. As a player, DeNoyer played four years at SUNY at Old Westbury from 2004-2008, where he earned bachelor’s degrees in both media communications and American studies.